Want To Impress The Ladies? Wear All Your Gadgets On Your Face | OhGizmo! Now, don’t come and tell us that the thing right there, on that picture, isn’t the hottest chick magnet you’ve seen all year. If strapping a weird looking velcro headband/helmet, and sticking all your consumer electronics on it isn’t the way to a woman’s heart, then we give up on trying to figure love out. We especially like how the device wraps around your chin, allowing you to affix the remote right below your nose, for that extra-classy look. It’s called the Multimedia Remote Control Wrangler, and comes in two styles “Retro Sportsman” (‘fro not included) and… “Antique Olive “. 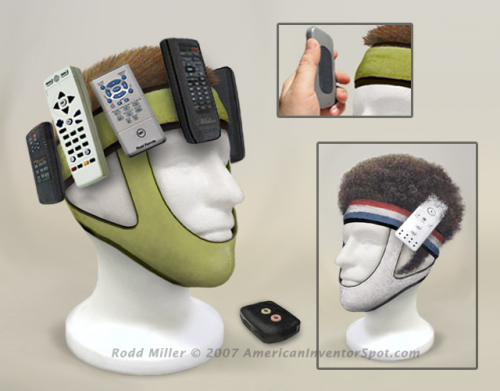 Of course, being made of velcro, remote controls are not the only things you can affix to it. Pricing and availability are not known, though the article we link to alludes to its existence in the Asian market. No surprises there. Thats a pair of underwear made out of velcro. Hmm… the way current trends are going I can see this being picked up by the “rappa/gangsta” crowd. Honestly, I don’t know why they do some of this stuff… Hello? Its not cool. You look stuuupiiid. This should fit right in as the “I wanna show off my $ so I’ll strap everything I have to my head” look. Is this an early April Fools Day joke? Oh baby, a man who can free up his hands like that makes me crazy! I just ordered 4 of them. Lol!! Chick Magnet?? You mean “Robot chick”? ?